When buying a pillow or cushion there are so many things to consider. What is the cushion cover made from? What is the cushion filling? Is it made of natural or synthetic materials? Does the cushion cover allow for refilling, or will I have to replace the cushion? At Home Upholsterer our range of scatter cushion inserts is trusted by the furniture, upholstery, interior design and soft furnishings industries because of their incredible quality and competitive pricing. 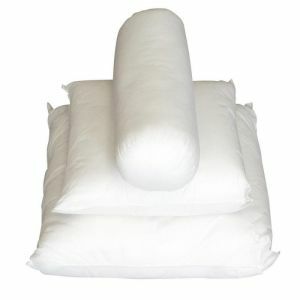 Our polyester fibre scatter cushion inserts are made from a high quality spunbonded non woven cover, complete with a durable zipper for easy refilling. We specially design these scatter inserts to be extra full, allowing for a soft but plump and voluminous aesthetic when the correct size is used. 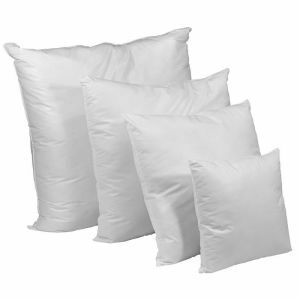 These Poly Fibre filled cushions are a great choice for indoor or outdoor use as they non allergenic, moisture and mildew resistant. If you are looking for a luxurious traditional filled scatter insert, you can’t go further than our mixed feather and fibre inserts. They offer the best of both worlds, with the plush look and feel of down, but the durability and resilience of polyester fibre, they are popular for high end furniture and interior designers. The addition of polyester fibre helps to ensure that feathers don’t clump together, with the feathers offering a soft, designer quality. They come in a high end cotton japara cover, complete with a zipper for easy refilling or resizing. We carry popular standard sizes of scatters in stock and have others available on special volume requests. You can purchase scatter inserts individually or in bag lots at discounted wholesale prices. Buy more and save! With competitive prices, a fully stocked warehouse and friendly customer service, shop online with Home Upholsterer for fast delivery around Australia. Or visit our team in store at our Sydney warehouse and showroom located in Chester Hill NSW.